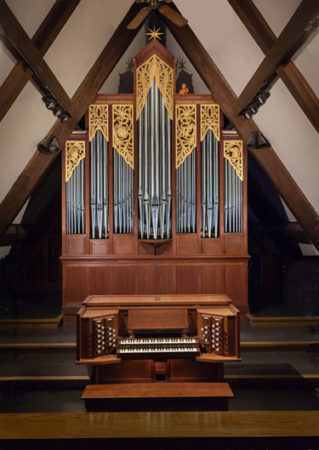 The pipe organ at St. Mark’s Episcopal Church was custom designed and built for our parish by the firm of J. W. Walker & Sons, Ltd. of Brandon, Suffolk, England. It arrived for installation on Shrove Tuesday of 1991 and was blessed and first used in services at the Great Vigil of Easter of that same year. While the organ is designed with electric stop action, the keyboard action is mechanical, or tracker. This means there is a direct physical link between the player and the pipes, and not an electrical one, as is usually the case. At the time of installation the two manuals and pedal were served by 20 stops, or voices, comprising 26 ranks, or sets of pipes voiced as a unit. The case is made of American Red Oak with hand-carved pipe shades depicting the four Gospel writers in their traditional symbols: an angel for Matthew, a lion for Mark, an ox for Luke and an eagle for John. When the organ was installed in February of 1991 we were not able to afford all of the stops called for in the original design. Therefore, as is often the practice with organ contracts, we installed a majority of the stops, but left room for eight additional ones to be installed later. This meant leaving space for them on the wind chests and providing stopknobs and switches. The only thing left to do was add the pipes. Early on, two of these prepared stops were added. One was a result of a lot of fundraising by the choir, and another was given as a memorial gift by some former choir members. This meant that six sets of pipes remained to be included. With the encouragement of Tanya and Jerry Carey, as well as a very generous gift from them, we undertook a capital campaign in the spring of 2015 for the purpose of raising the funds needed for several things: the completion of the organ (which will include a complete overhaul and cleaning), a grand piano for Mahon Hall, a grand piano for the nave, and funds for a four-month recital series. This campaign was chaired by Ellie Dunham. We then purchased a grand piano for Mahon Hall from an Episcopal priest in Chicago, Father Tim Yeager. This is a wonderful 7-foot Baldwin grand piano which he acquired some years ago from Wheaton College. Its inaugural concert was Sunday, October 5, 2014. The organ was completed by September of 2015. It now comprises 30 stops, two of which are digital, 38 ranks, 1,987 pipes, and a Cymbelstern (rotating star with bells). In February of 2016 we will observe and celebrate the 25th anniversary of its installation. That month, and for the next three months, we hosted a series of organ concerts to commemorate this important anniversary. Included in that roster of performers were some of the world’s most well-known concert organists: David Briggs from St. James Anglican Cathedral in Toronto, Isabelle Demers of Baylor University, Raul Prieto Ramirez from Barcelona, and Marie Bernadette Dufourcet Hakim from Paris. St. Mark’s will host international concert organist Gail Archer on Sunday, April 22, 2018 at 5:00 p.m. for another installment in its organ recital series. – Dr. Gerre Hancock, February 21, 1934 – January 21, 2012.